Irvin Leisure Filming? You are having a laugh! 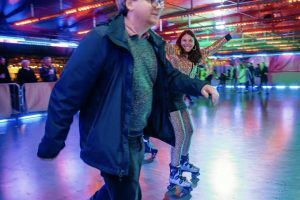 In recent weeks we have been happy to have been used for two film productions for future comedy TV productions, and one major advertisement shoot. The first comedy was shot in Roundwood Park in Willesden, and will be shown on ITV1 later on in the year. The title of this is a little unclear, but the production team dismantled and re erected stalls, rides and food units over a two day period, shooting part whilst we were open to the public and part whilst we were closed. We want to thank the London Borough of Brent for allowing us extra access to the park whilst the filming was completed. The second comedy was shot in Mile End Park, and this was for That Mitchell and Webb Experience, a very well known slightly surreal series. This was shot entirely whilst the fair was open and I am not sure if the thousands of families who visited the fair appreciated that the blond beauty in the brief bikini on the Helter Skelter was part of a film set and not one of the fairground staff, but anyway it seemed to be a most popular distraction. It was surreal in itself to see these two well known TV performers sat on the traditional “Director Style” seats in the corner of the park whilst around them hundreds of young children, totally and happily oblivious to celebrity, carried on with their favourite funfair games. 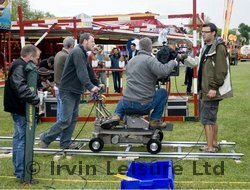 Normally when we work with TV companies we assist with the scripts and plots, to ensure that the filming at the fair is realistic and accurate. However we want to make it clear that we did not work on the scripts of these two programmes at all, just in case they are not in fact funny! The third filming recently undertaken was on Clapham Common, and I want to make it absolutely clear that we had nothing whatsoever to do with the script or the concept, because this was for the Vodafone Showers advertisement. You know the one, where the people using their phones get belted around the ears by large metal lumps falling from the sky. It is not clear to me why on earth anyone would want to buy a phone that leads to you being whacked on the noddle by a nugget, but Vodafone have considerably more money than me so I do assume they know what they are doing! All of these three films were undertaken at sites at which Irvin Leisure was already operating and so this made a significant saving for the production companies. Thought you might like to know that!